Just finished one of the most unusual shows ever: the front row of my audience was 850 miles away. 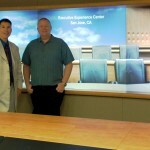 I was at Polycom‘s high tech Bellevue RealPresence Experience (RPX) studio and my audience was at Polycom’s San Jose RPX. RP-what? 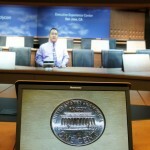 Picture Skype on steroids: the audience can see and hear me, and I can see and hear them. 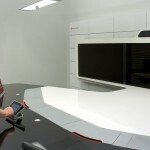 It all happens in an immersive environment that brings HD video, audio, and content-sharing to a cinematic video wall. The technology is practically invisible; I felt like I was in the same room with the audience. 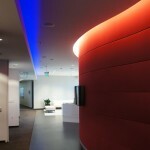 Geek alert: the Executive Conference Center would fit right into Star Wars or Star Trek. A penny in San Jose is magnified with amazing detail in the document viewer at the Bellevue RPX. 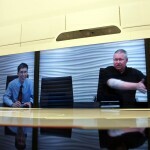 Polycom creates videoconferencing solutions for businesses and organizations. 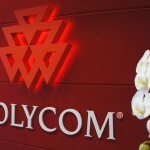 Polycom: high def, high tech, high class. Me: Bellevue. Audience: San Jose. It was difficult designing an entire show with no direct audience contact. Much of what I do revolves around physical interaction with people (pick a card, stand here, hold this, examine this, let me borrow your watch, etc.). That element is gone. Sure, there are certain tricks that are just “eye candy”, that you can watch like a movie or television. However, the strongest magic tricks are those that happen in the hands of a spectator. I wanted to create material that would make that possible. My goal was to create routines where the magic happened in THEIR studio, in San Jose, in such a clean way that there would only be one possible explanation: real magic. A week in advance I mailed a Poloroid camera (yep, I still had one! ), some envelopes, predictions, and three brand new decks of cards. (I performed three shows for three different groups as they toured the facility for “Polycom Days.”) It was a cool moment when, across the room yet in another part of the country, four people turned over ripped halves of playing cards to reveal a perfect match. Yes! 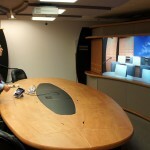 When they’re not trailblazing the use of their “immersive telepresence solutions” to spread magic to the world, Polycom’s teleconference studios and technology are used for executive meetings and conferences. 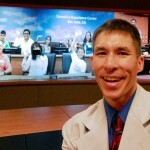 This entry was posted in Uncategorized and tagged Bellevue, magician, Polycom, Polycom Days, Polycom magic, RPX, Seattle, skype, teleconference, virtual magic. Bookmark the permalink.